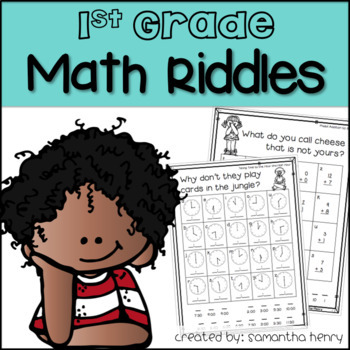 Make math FUN with these 1st grade math riddles and jokes!! This packet was designed for 1st grade but can also be used as remediation or enrichment for Kindergarten or 2nd grade classrooms as well. These riddles will fit perfectly with your COMMON CORE standards! There are a total of 23 riddles/jokes in this pack. Answer keys are also included!! Q: What stays in the corner and travels all over the world? Q: Why don't they play cards in the jungle? These sheets are great for practicing math skills and demonstrating mastery. Your students are sure to love them!! 23 JOKES & RIDDLES IN ALL!! !